They would be college graduates now, poised on the brink of life, had not a train gone off the tracks two years ago in a tragic fateful moment that caught them where they should not have been. After almost two years of investigation into a 2012 train derailment in Ellicott City, Md., the National Transportation Safety Board said a piece of rail near replacement age simply snapped under the weight of a half-mile-long train carrying 9,873 tons of coal toward the Baltimore docks. Elizabeth Nass and Rose Mayr, both 19 and celebrating their imminent return to college, were sitting a few feet away on a trestle 20 feet above Main Street. They were buried beneath the spilling coal. Death transformed them into a parable for being in the wrong place at the wrong time, and for the random cruelty of fate. The details played out on the airwaves and in print as far as Australia. Last month, the parents of the girls spoke out for the first time, releasing a statement through their attorneys saying that the CSX railroad was to blame. The NTSB report is more meticulous than captivating. It describes details of the accident and gives a broader picture of a freight rail company struggling to stay ahead of deterioration on the oldest stretch of common carrier rail line in the United States. It describes how the three crew members had the train rolling at 23 mph, just below the acceptable limit, when the emergency brakes slammed it to a halt. They got out to discover that 11 cars had overturned, including eight that had dumped their loads as they toppled into a parking lot below. The NTSB report said the railroad was aware of the history of rail defects on that line and of the increased volume of coal tonnage the line was carrying. As a result, the report said, CSX ran ultrasonic tests on the rails 11 to 12 times a year, far more frequently than regulations require. The rail had been tested by federal regulators in July 2012 and by CSX 17 days before the Aug. 20 derailment. 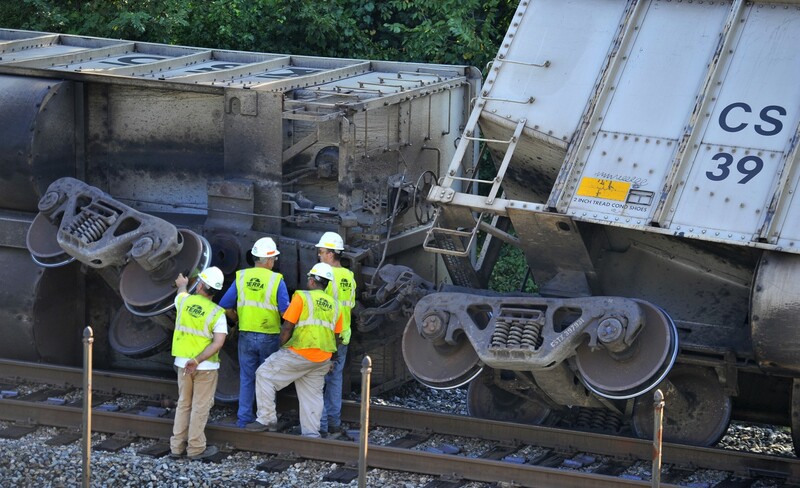 “In the area of the derailment, no defects were recorded” by that CSX testing, the NTSB said. After the accident, some people in Ellicott City said the railroad bridge was a place where underage people went to drink out of sight of others. Just before they died, Nass tweeted, “Drinking on top of the Ellicott City sign,” a reference to the welcome sign painted on the bridge just below their dangling feet. The underage girls were not heavily inebriated, the NTSB report said. One had a blood alcohol level of 0.05 and the other was at 0.03, both below the limit of 0.08 for driving a car.